iPhones are undoubtedly one of the most popular smartphones on the market, but when it comes to durability, they’re a little bit lacking. There’s nothing worse than getting your hands on a brand new shiny phone just to cover it up with a big, bulky case, but there’s also nothing worse than dropping said shiny phone on the floor and paying for the screen to be repaired after one week. But phone cases don’t have to look cheap and tacky. A decent phone case will look stylish, and provide protection to both the body and screen of your phone. There are a few different types of iPhone case you can get, the most popular being silicone or hard shells. These protect the phone itself from scratches or marks from general wear and tear, but if you drop the phone screen down, it could still be game over. Therefore, look out for cases with a large lip around the edge which will stop the phone screen from touching the ground when it falls, or cases that comes with a screen protector, which should help absorb the impact and prevent scratching. iPhone cases don’t have to be all about protection either. Wallet cases that also have space for ID and bank cards are a great way to keep everything in one place, and they also cover up the screen when not in use so you won’t get any smears or scratches, and you can also get photo enhancing cases that allow you to make the most of your iPhone camera wherever you go. 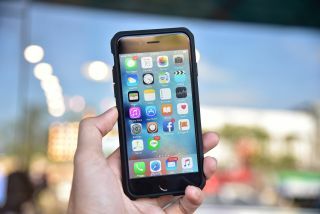 We’ve picked out some of the best iPhone cases for teenage boys, to suit all styles and budgets, so you won’t have to risk damaging your most prized possession when you see the options on our list. Okay, so it may not really cost as much as an iPhone, but this waterproof action camera case is quite pricey. However, that’s because it’s really, really awesome. This iPhone case has the ability to turn your smartphone into an underwater camera that can capture some great action shots on all of your adventures. It’s waterproof up to 10 metres and it can survive a fall of up to 20 feet. What’s more is that this phone case comes with four aluminium and glass lenses including wide angle, macro and telephoto 2x zoom. So if you’re a budding photographer, this iPhone case will turn you into a pro. We recommend fitting the case and testing it at home before literally diving in the deep end with it, but many users have said it works really well and is great at capturing shots in the pool! This smart iPhone case for teenage boys is great for carrying around your phone, money and cards all in one place. It flips over to cover your screen when not in use to stop it from scratching, and it has a magnetic fastening to keep everything contained. The only downside is it can get a little bulky when carrying too many notes or cards, but if you’re prone to dropping your phone then this iPhone case will stop your screen from getting any scratches or cracks. The case does cover the camera slightly so you need to remove it to get a good photo, but for those on the go, this is a great option that means you don’t need to carry a wallet too. This robust casing will ensure your mobile survives any drop with its silicone layered outer and inner crash shell which deflects impacts to ensure your smartphone stays in one piece. It is one of the best iPhone cases for teenage boys who are always out and about on their bike or skateboard, and can be prone to dropping their phone. It also comes with an anti-scratch screen shield and has sealed ports to protect your phone from rain, sand and dust; perfect for all eventualities. It’s a pretty basic design but ultimately one of the strongest iPhone cases for teenage boys on the market. This stylish iPhone case is a funky design that teenage boys who enjoy gaming would like. It’s a soft silicone case, so it doesn’t offer as much protection as some of the hard shell cases, but it will still soften a blow if you were to drop your phone at any point. You’ll get a screen protector and cloth to ensure your screen stays in tip top shape, and you can choose from three different controller designs depending on your gaming preferences. If you’re looking for an affordable but stylish addition to your phone, this iPhone case gets the job done nicely. For those who really don’t want a case for their iPhone, then this simple silicone case from Apple will give your phone a little bit of protection without looking to cumbersome. It features the Apple logo so it will simply act as a second skin for your phone to prevent any dents or scratches on the backing. It’s pricey for such a plain case, but that’s because it’s an Apple original product. However, this case is favoured by customers as it’s easy to handle and it doesn’t get in the way of any of the side buttons, charging port or camera, and for that, it’s worth the money. If it’s all about style, then this is one of the best iPhone cases for teenage boys as it features a range of characters and logos from games and comics, to create a collage design that stands out from the crowd. It is a simple plastic case that is easy to clip onto your phone, and it is slim and lightweight while still protecting your phone from bumps and scrapes. Many customers have said their teenage son was very happy with this phone case, and that it is of very high quality. A sturdy yet stylish case overall.